← Do Pets Have Psychic Abilities? The folks at this amazing non-profit liberate Boxers from nearby shelters and humane societies, accept surrenders directly from owners who are no longer able to provide quality care, and welcome strays in any condition. The rescued pups are then transferred to one of many caring volunteer foster homes in both Carolina states, living indoors with their temporary pet parents. Every Boxer receives a complete physical, immunizations, sterilization, heartworm test and treatment for any illnesses or diseases. Each prospective fosterer and adopter must complete extensive contracts, provide veterinary and personal references, and undergo a home visit with a qualified representative of the rescue. In spite of minimal resources, Carolina Boxer Rescue (CBR) has consistently maintained averages of 50-60 adoptions every year. Fosters average 3-4 month stays, although others will remain much longer (as much as a year or more). At any given time, they supervise the fostering of 25 or more Boxers in private homes throughout the Carolinas. CBR is insistent upon ensuring that their Boxers will never be outside dogs, because they strongly believe this breed is extremely people-oriented. 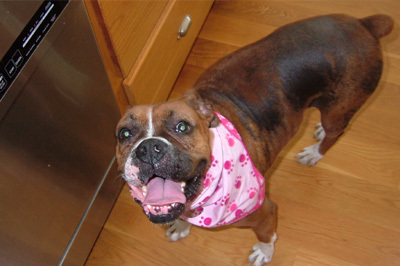 Generally, Boxers do not thrive if left to their own devices … if not accompanied by their pet parents, they will find a way to entertain themselves, in the form of barking, digging or escaping from a fenced yard to explore the world. With single-layered coats (many dogs have two layers), Boxers are particularly susceptible to heat stroke in the summer and hypothermia in the winter. Thanks to the diligent and resolute efforts of a handful of volunteers and a broader network of caring foster parents, CBR is able to ensure the safety, proper socialization and happiness of their rescues. They view their volunteers with utmost appreciation, as they are “by far the most important necessity” for their operation. Without their volunteers, CBR knows that many more Boxers would be euthanized in area shelters. CBR plans to use the Dr. Jane’s HealthyPetNet Foundation donation to help cover the costs of veterinary care for many of their Boxers, including surgeries and especially heartworm treatments which are needed by nearly 80% of their rescues. Thanks to the size of this particular grant, our largest to date, CBR anticipates being able to cover the costs of the heartworm treatments for all of their Boxers in need of this life-saving medicine. On behalf all of the dogs who have experienced a vastly improved life due to the continuing efforts of this rescue, we offer CBR our unending thanks. Their unwavering steadfastness to creating happily-ever-after stories for so many Boxers over the years made awarding this financial grant our immense pleasure. If you would like to provide additional financial support to our foundation, you may do so when placing an order online or by sending a check or money order to the Dr. Jane’s HealthyPetNet Foundation, Inc. at P.O. Box 1425, Palm City, FL 34991. Even if you can only spare a dollar or two, you’ll be providing much-needed aid to organizations just like the Carolina Boxer Rescue who work every day to reverse the trend of animal homelessness in America. Most especially, we are thankful to all of our readers and customers who, through their personal donations and continued patronage, make all of our grants possible. Your compassion and generosity has helped to bolster this committed network of volunteers’ efforts to make the world a better place for abandoned, abused and neglected Boxers. They are doing great work- congrats to them! I'm so proud to be a part of Life's Abundance! Thanks for the update. It's wonderful to know that a percentage of all our sales goes to this awesome foundation to help abandoned pets all over the country. It's great to be a rep with Life's Abundance. Good job Dr. Jane and Dr. Sarah for keeping us educated and informed.